"Allmächt'ger Vater, blick herab…." The grave radiance of the hero's prayer from the twenty-seven-year-old Wagner's Rienzi, Last of the Tribuneshas found superstar champions from Lauritz Melchior to Jonas Kaufmann. For listeners who wish to seek no further, two excuses will serve: Wagner disowned the opera, and Hitler adored it. Then again, these might be reasons to take a hard look. The third of the master's works to be completed, the second to be performed, and the first to survive its premiere, Rienzi mimics the blockbuster style then in vogue in Paris. Cheered to the rafters at its Dresden premiere in 1842, its pageantry, high-flown rhetoric and grand tragic design epitomized a fustian past the later Wagner meant his Artworks of the Future to sweep away. YetRienzi'spopularity endured into the early twentieth century. Its performance history since then has been sporadic but unbroken. A partial roll call, in chronological order, of heldentenors who have passed along the last tribune's torch runs from the now "historic" Max Lorenz, Wolfgang Windgassen, Giuseppe di Stefano (?! ), and René Kollo to our contemporaries Robert Dean Smith and Christopher Ventris. Audio is out there in abundance. But right now and for the foreseeable future, the stupendoustitle rolebelongs to German heldentenor Torsten Kerl, the only Rienzi to date to have made his way to video, first in Philip Stölzl's production for Deutsche Oper Berlin (2010), now in Jorge Lavelli's for the Théâtre du Capitole, Toulouse (2012). In both versions, Kerl is in full command, unfazed by the fiendishly high tessitura, grandiloquent of phrase, purposeful and trenchant with text. As an actor, he simply eats up the stage. The full moon of his features in whiteface (worn in both shows) changes phase in no time from soft to severe, evoking now Leoncavallo's weeping Canio, now some National Treasure from the Grand Kabuki. Like Stölzl, Lavelli views Rienzi through the prism of totalitarianism, projecting Rienzi onto the fascist demagogues of the twentieth century. Like Stölzl, Lavelli relies heavily on newsreels, chalked faces and masked masses. But where Stölzl'scinematic and expressionist flourishes add up to triumphant total theater, Lavelli's dull, relentlessly symmetrical tableaux just die there, exposing the inherent hollowness of the conceit. Rienzi's agenda in strife-torn Rome is to restore peace and the rule of law. To this end, he sacrifices personal vengeance and tempers justice with ill-timed clemency. Neither the brutish nobles nor the fickle commoners forgive him for the idealism that is his fatal flaw. If, as is said, Hitler identified with Rienzi, any parallel existed only in his sentimental, self-deluding dreams. In the trouser role of the aristocrat Adriano, torn between clan loyalty and his love for Rienzi's sister, Daniela Sindram makes a frazzled start but displays bright, slashing authority later on, when the stakes are highest. 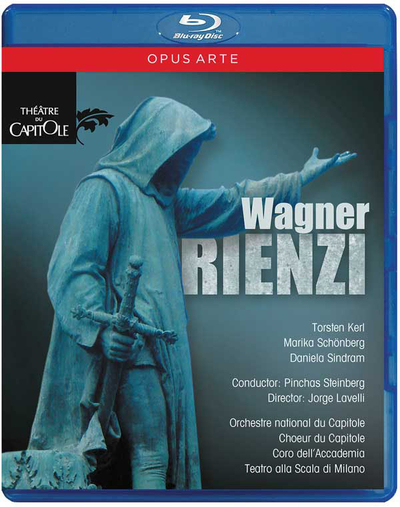 The proto-Sieglinde to Rienzi's proto-Siegmund, Marika Schönberg's Irene all but oozes dazed incestuous devotion. It's too much, but she spears her high notes with abandon. In the cameo of the Messenger of Peace, Jennifer O'Loughlin pipes like the sweetest of Forest Birds. For the rest, the singing in the lesser parts ranges from unobjectionable to indefensible. Originally performed with cuts in Dresden and in subsequent revivals, the manuscript of Rienzi seems last to have been accounted for in Hitler's bunker. For the BBC Northern Symphony, British conductor Edward Downes reconstructed the score as completely as possible. His recording clocks in at an epic four and a half solid hours of music, including a forty-minute pantomime. The Berlin version, credited to Philip Stölzl and Christian Baier, comes to a brisk two and a half hours. The Toulouse edition, prepared by conductor Pinchas Steinberg, runs an expansive three hours, delivered with momentum, brio and spells of hazy introspection, all valuable commodities here. So, what exactly will it be when the wind blows?